Continuous insulation throughout its entire envelope with minimal to no thermal bridging. An extremely airtight envelope that prevents infiltration of outside air and loss of conditioned air. High-performance windows (double or triple-paned windows depending on climate and building type) and doors. A balanced heat and energy recovery ventilation system. Such building consume about 90% less heating energy and 75% less overall energy than “average” new construction, according to the Passive House Institute (PHI), which administers the PH certification program. But PH is more than just a designation. Founded in Germany 25 years ago – the first Passive House was built in Darmstadt, just south of the bustling city of Frankfurt – PH has become a general concept for any building that adopts the “passive” lifestyle. While the standard has been popular in Europe and Canada for several years now, more recently a United States program (PHIUS) has been established, aimed at growing the domestic high-performance passive building movement. And it is indeed growing. Some firms have made the PH concept a top priority-and the norm. Richard Pedranti Architect (RPA) specializes in PH and high-performance buildings, primarily serving the Upper Delaware River Region, as well as Philadelphia and New York. 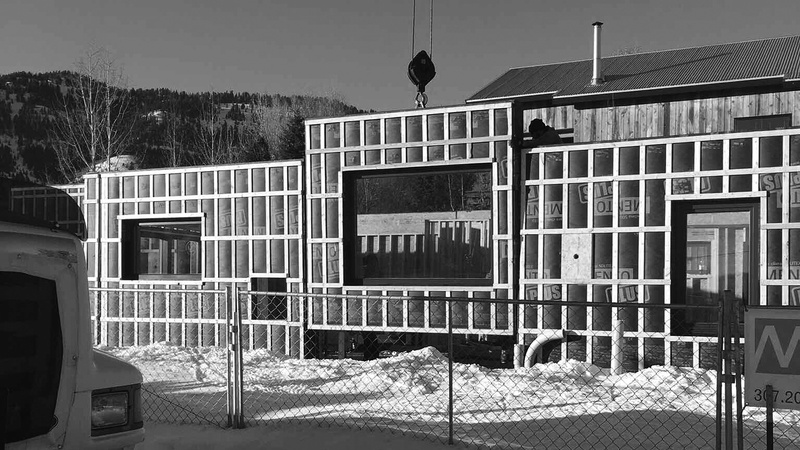 The company has implemented a dynamic envelope assembly for multiple projects, including the Reed Passive House in Wilson, Wyo. (currently in design), the Keffer Passive House in Pike County, Pa. – a weekend family retreat for a retired couple from New York metropolitan area, the state’s first home to meet the Passive House Standard – and the Soeder Passive House in Bechtelsville, Pa.
A 12-in. layer of dense pack cellulose for the thermal insulation. An exterior layer of solitx mento that provides water protection but also lets the wall breathe. ZIP wall sheathing attached to the 2×4 structural frame serving as the air barrier. ZIP sheathing also serves as the vapor barrier. It has a service cavity (2×4) structural wall with the air barrier to the outside of the service cavity so the air barrier is protected. The exterior insulation over the air barrier also greatly reduces the condensation risk. It is thermal bridge-free because the insulation layer is on the outside of the structure. It uses conventional building materials and building techniques. It is vapor-open so moisture vapor can pass through the wall and dry out when necessary. The cellulose is hydroscopic, meaning it can hold or buffer moisture vapor, which contributes to stable relative humidity on the interior. It has a rain screen on the outside of the water control layer (Solitex Mento) that allows the cladding to breathe and prevents moisture being trapped behind the siding. Given the comfort and efficiency that this type of envelope can provide, the fact that it pushes a project toward PH certification becomes somewhat of an added bonus. 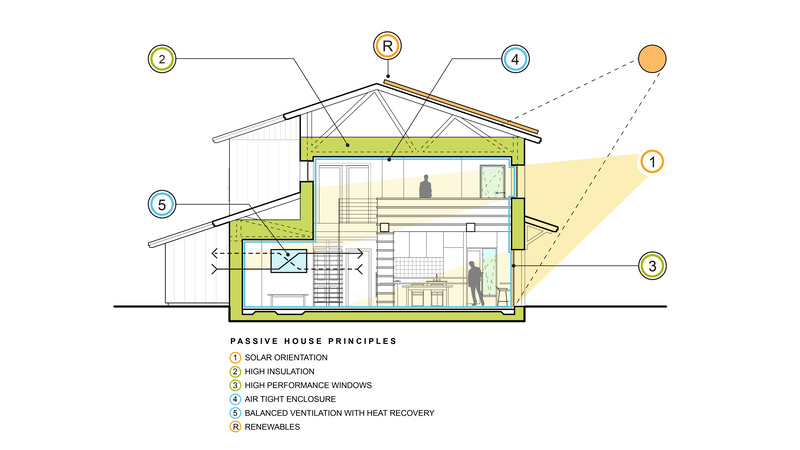 “We have found that once out clients learn that they can have a house that is very comfortable and healthy, and also uses very little energy for heating and cooling, we don’t need to work very hard at selling the remarkable Passive House approach to home building,” says the firm’s founder, Richard Pedranti. To read the full article, see the NZB – Net Zero Building magazine March 2019-Volume 8, Number 1 edition.